It’s finally time for some festive baking, don’t you think? I love pre-Christmas baking sessions and today’s recipe for Easy Chocolate Gingerbread Biscuits and my Melt In Your Mouth Almondy Mince Pies are my two favourites. I went one step further this year with my gingerbread dough and added some cacao powder (cocoa powder will work just as well) for that extra something. It is only a tablespoon of cacao but my intention wasn’t to make these biscuits taste fully of chocolate but more like gingerbread biscuits with a touch of chocolate! I’m pleased to report that it worked really well and added extra flavour dimensions to the familiar flavour of gingerbread biscuits but if you rather leave the cacao/cocoa out then please do. Should I ice my biscuits and what’s the easiest icing to prepare?! We usually go for half and half! My youngest love iced biscuits but my eldest doesn’t so we tend to compromise and meet in the middle. When it comes to making things look pretty I don’t really have a hand for things like that so my iced creations tend to look a bit “rustic” to say the least! I usually use simple icing sugar and water mixture with a touch of vanilla (see recipe below). The amount of water you use will depend on the consistency you would like to achieve and some environmental factors too like humidity etc. I usually start adding water bit by bit and mixing it in until I get slightly batter like consistency which is not too thick to not want to come out of the bag but also not too runny. Feel free to try some on the baking paper first and see whether it needs a touch more water. For those not very confident with their decorating hand I can highly recommend simplest squeeze bottles like the ones used for sauces in the cafes. I find them so much easier that using piping bags. Can I freeze my Easy Chocolate Gingerbread Biscuits? The answer is yes! If you want to get ahead with your Christmas prep, freezing your biscuit dough is the way to go. I would recommend freezing the dough rather than baked biscuits though – personal preference. If freezing the dough, shape the amount you want into a flat disc and wrap tightly in clingfilm. Pop the wrapped dough disc in the freezer bag or container and into your freezer for up to 3 months. Defrost it overnight in the fridge and roll out, cut shapes and bake as per the recipe below. If freezing already baked biscuits (uniced!) make sure they are completely cooled. Lay them flat in a freezer safe, plastic container and separate with layers of greaseproof paper to prevent biscuits from sticking. 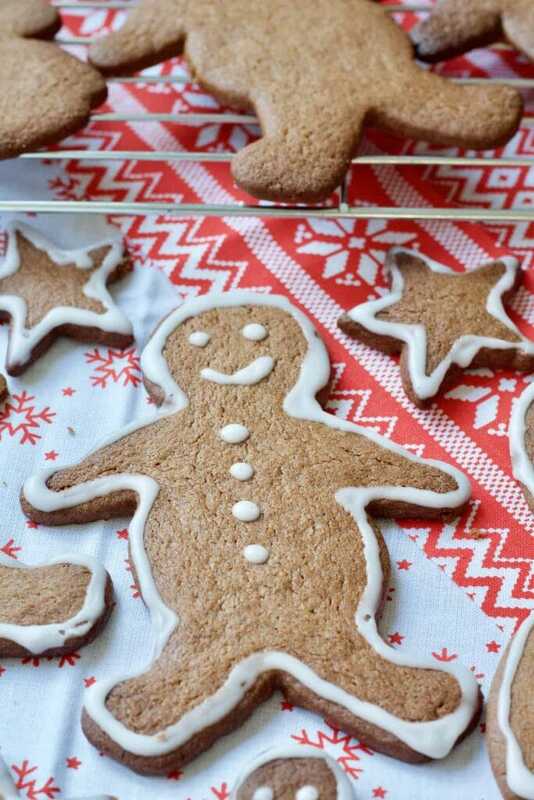 If you happen to have some room in your freezer you might want to freeze your gingerbread biscuits on baking sheet first and once frozen transfer them into a freezer bag. When defrosting make sure you take them out of the bag or container first to prevent the condensation from making them soggy as they thaw. Once out of the freezer they defrost in no time at all. How do I store my Easy Chocolate Gingerbread Biscuits? For best results store them in a biscuit tin or jar with tightly fitting lid, separately from other types of biscuits for 2-3 weeks. Put all your dry ingredients into food processor and give them a quick mix. Using pulse button start mixing the ingredients until they form a smooth dough ball. Add butter, egg and golden syrup. Turn the dough out onto kitchen counter and divide it into two flat discs. Wrap in cling film and chill in the fridge. 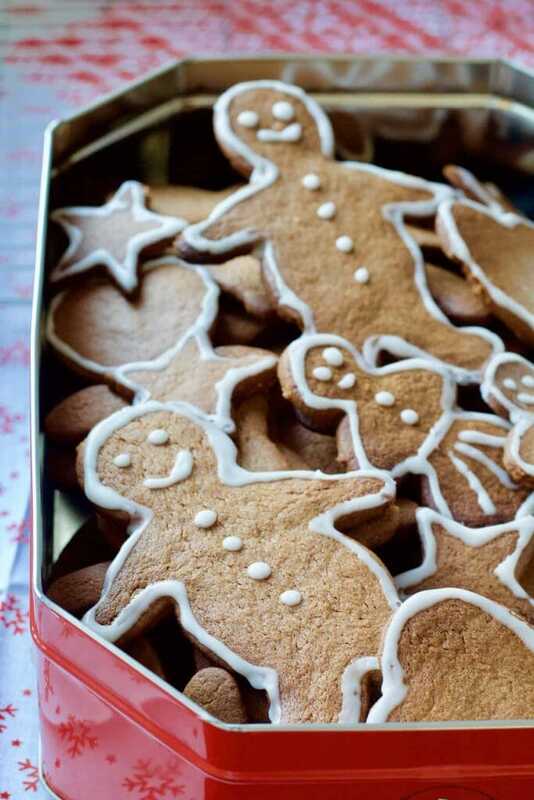 These Easy Chocolate Gingerbread Biscuits are full of Christmas spices & a touch of cocoa. 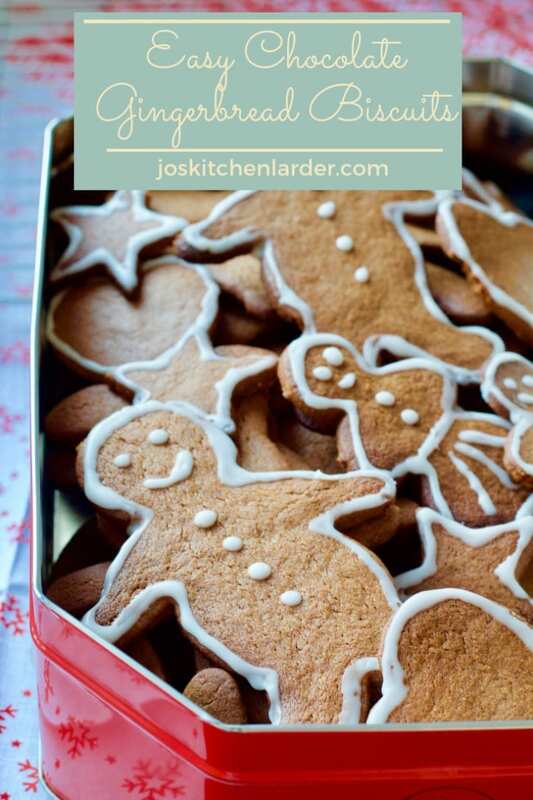 Perfect crunchy Christmas biscuits you can bake with your kids! Put all your dry ingredients in the bowl of food processor and give them a quick mix. Add butter, egg and golden syrup and start pulsing gently until you get a ball of nice silky dough. Turn out onto the kitchen counter, divide dough in half and shape into two flat disks. Wrap them in cling film and put in the fridge for approx. 1 hr. The longer the dough stays in the fridge the easier it will be to work with. If you don't have food processor simply sieve your flour, cocoa and spices into a large bowl. Add brown sugar and give everything a good mix. Add cold and cubed butter and rub it into the flour mixture with your fingers until you get breadcrumbs like consistency. Add egg and golden syrup and mix them in with your hand, kneading gently until you get smooth and silky dough. Proceed further as per instructions above. After the dough has had time to chill, take it out of the fridge and onto the floured kitchen surface. Roll it out to the thickness of pound coin and cut the shapes using the cutter of your choice. Re-roll the remaining dough and repeat until you've used up all the dough. Bake your biscuits on the baking sheet lined with baking parchment in the oven preheated to 180C/350F/Gas Mark 4 for approx 10-12 min. Transfer baked biscuits onto cooling rack and repeat with the remaining ones. Wait for them to cool completely before icing! Enjoy! Sieve icing sugar into a bowl and add your vanilla extract (if using). Slowly add some water a teaspoon at a time and whisk it in judging the thickness of your icing. You don't want it to be too runny or too thick but somewhere in the middle. It needs to be thin enough for you to be able to squeeze it onto a biscuit. Remember you can always add more water or more icing sugar if you make your icing too thin. Feel free to trial it out on some baking paper. Pipe your icing onto the cooled biscuits using piping bag with its end snipped to create tiny opening or use a simple plastic squeeze bottle which is what I prefer to use when decorating as you have more control over your icing. Once you've finished decorating your biscuits leave them on the cooling rack for the icing to set. Pop them into your biscuit tin and enjoy responsibly 😉 ! This recipe yields approximately 50 biscuits of different shapes and sizes. The amount of biscuits will differ depending on the size of the cutters you use. Feel free to omit cacao/cocoa powder which will result in regular gingerbread biscuits. Feel free not to use vanilla extract in your icing and use simply icing sugar and water. Store your biscuits in an airtight container for 2-3 weeks. For details regarding freezing see the post. Pin Easy Chocolate Gingerbread Biscuits for later! I absolutely love the sound of these Jo – the addition of the chocolate is a winning idea in my mind. These look great Jo and I love that you have added cocoa powder to the usual Christmas biscuit recipe. My boys would love making these and then decorating them – plus all the mess that ensues lol! Thanks Jenny! Bit of cocoa really makes a difference here. These are super child friendly and that’s what Christmas baking is all about (including the mess lol)! I’ve not seen chocolate gingerbread biscuits before but the flavours would be so delicious together. I’m not too bad piping buttercream but with icing like you’ve used for these biscuits, I’m not so good! I made gingerbread men last year and they looked like they’d be in a bit of an accident! I love gingerbread biscuits I used to make gingerbread men when the kids were little, now i make more grown up shape but the recipes the same. I like how you have decorated them, fully iced biscuits are a bit too much for me.